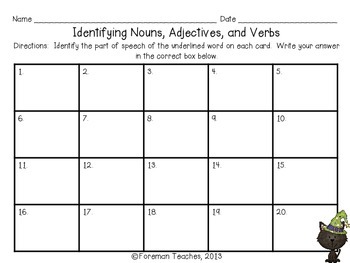 This center resource includes practice with identifying nouns, verbs, and adjectives. 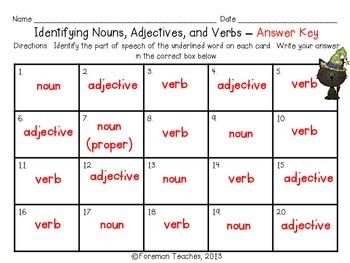 I have included 20 task cards, recording sheet, and an answer key. You are welcome to print the cards in color but they look fine printed in grayscale. I print the title page in color, laminate it, and glue it to the front of a 9x12 envelope. I copy the task cards in color (or using black ink onto color cardstock), laminate, cut out, and place them in Ziploc bags. I place the Ziploc bag, recording sheets, and laminated answer key in the envelope for storage. 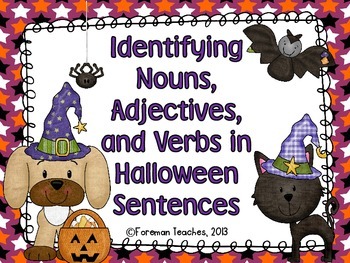 If you have any questions about this product, please email me at ForemanTeaches@gmail.com . If you like this product, please follow my store to find out about new resources as they are posted.